‘Rome wasn’t built in a day’, while this phrase commonly serves as an idiom in which to encourage patience and perseverance to the receiver, the phrase remains a historical fact as well, and one that can clearly be seen in but a brief account of Ancient Rome’s development as a city. Rome’s foundation, dating back to around 753 BCE, is detailed within the Roman myth of Romulus and Remus. Although the tale of Romulus and Remus is subject to more fantasy than history, there does seem to be some merit of truth in the tale. This would be due to the hill of Palatine (one of the seven hills in Rome) containing early proto-urban structures, that was fortified by both a wall and ditch, dating back to the 8th century BCE (2005, Smith). Therefore, one can conclude that Rome’s foundation, as a permanent settlement at least, dates to around the time of the mythological foundation of Rome in 753 BCE. 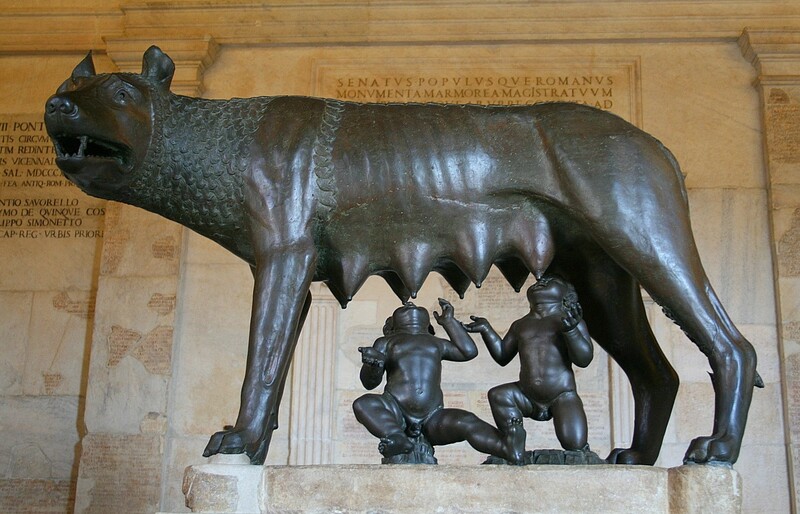 The world-renowned statue of La Lupe (She-wolf) with Romulus and Remus suckling below, for more on the legend be sure to check out recommended reading under the Romulus and Remus section below. Image Courtesy of Wikipedia Commons. Moving on from Rome’s origins, many would undoubtedly think that if one could simply fast forward through seven centuries of time to the lifetime of Julius Caesar then surely Ancient Rome would be nearly identical to what we think of today, which thanks to Hollywood’s plethora of productions (e.g. HBO’s Rome, Starz’s Spartacus, etc.) would be full of majestic marble structures and clean cobbled roads. However logical this previous assumption might be, it is still an incorrect one, as Rome’s general aesthetics and architecture still left much to be desired even during the lifetime of Julius Caesar (100 BCE-44 BCE). In fact, Julius Caesar’s successor Augustus, whose reign was from 27 BCE-14 CE, was famous for the following statement: “I found Rome a city of brick and I left it a city of marble” (Suetonius’s Life of Augustus 27:30). Despite all the self-claim of Augustus’ architectural accomplishments, this may not have been as true as one study now suggests (Pietkiewicz, 2015). Regardless of this previous debate, there was still one grand piece of Roman architecture that had yet to be created, and what is truly baffling is that for many individuals this architectural piece has come to define the city ever since. The missing structure in question would be none other than the world-famous Colosseum, and despite the structure’s great fame too few know the origins of the structure, or even its original name; both of which shall now be detailed below. 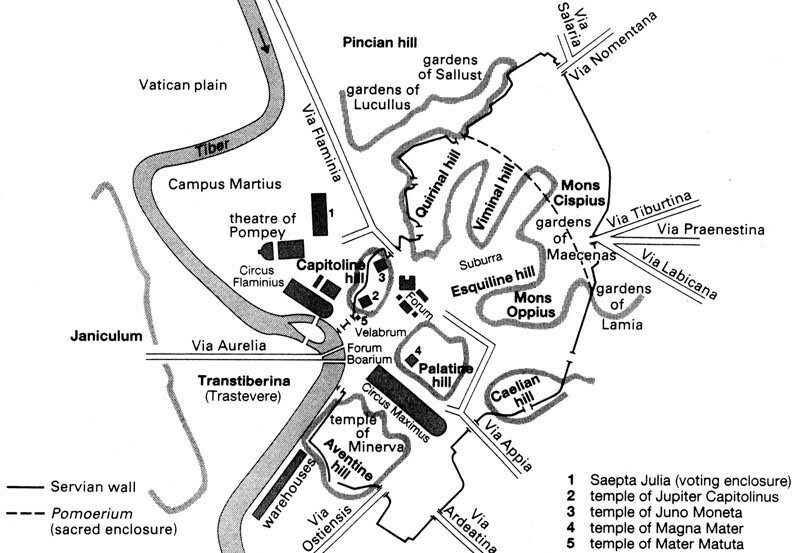 A map provided by hsie-kingsgrove, detailing the layout of Rome during late Roman Republic. Note the lack of the Coliseum. 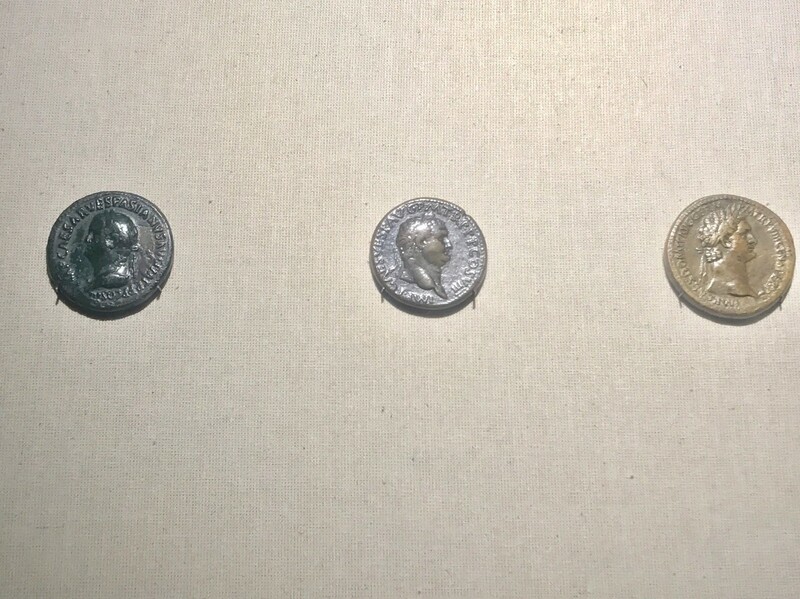 Caption: Three coins on display at HMNS’s Special Exhibit of Gladiators: Heroes of the Colosseum. (Left to right: Emperors Vespasian, Titus, and Domitian.) Photo taken by Franklin Alexander. The three coins above while arbitrary at first glance, detail both the members of The Flavian Dynasty: Vespasian, Titus, and Domitian, while also displaying the ‘masterminds’ behind the Colosseum’s construction, which in Ancient Roman times was known as the Flavian Amphitheater (2005, Beard). And while the Flavian dynasty (69 CE- 96 CE) was a relatively short dynasty in comparison to the other Roman Dynasties, the Flavian’s “contribution” has proven its cultural longevity and is arguably second to none. To give a brief overview of the construction of the Colosseum one would need to go back to the rule of Nero (37 CE-68 CE). Nero has become one of the most infamous figures in history, due in part to his notorious acts of murdering his own mother and first wife, while also allegedly playing the fiddle while Rome was burning. It is what came after the burning of Rome in 64 CE that is important for the context of Colosseum’s origins. The devastating fire allowed for a new plot of land to become available, and it was on this plot of land that Nero built his “Domus Aurea” (English: “Golden House”). Nero’s Golden House was to put it lightly extravagant, complete with 300 ‘entertainment’ rooms, a massive bronze statue of Nero himself, and an artificial lake to top it all off. After Nero’s suicide in 68 CE, his successors (the Flavians) decided to sever all ties to Nero, who due to his lavish lifestyle and other public matters had horrible public relations with the Roman public. As such, Nero’s Golden House under the Flavians was decommissioned and used for raw material for other projects, and one of these other projects was nonother than the Colosseum itself. One last fact about the Colosseum would be that it was built upon the Golden House’s artificial lake, which allowed the Colosseum to be flooded for special aquatic events and battles with relative ease. Caption: Above is an artistic impression of the Colossus of Nero, original constructed directly outside the main entrance of Nero’s “Domus Aurea” (Golden House). 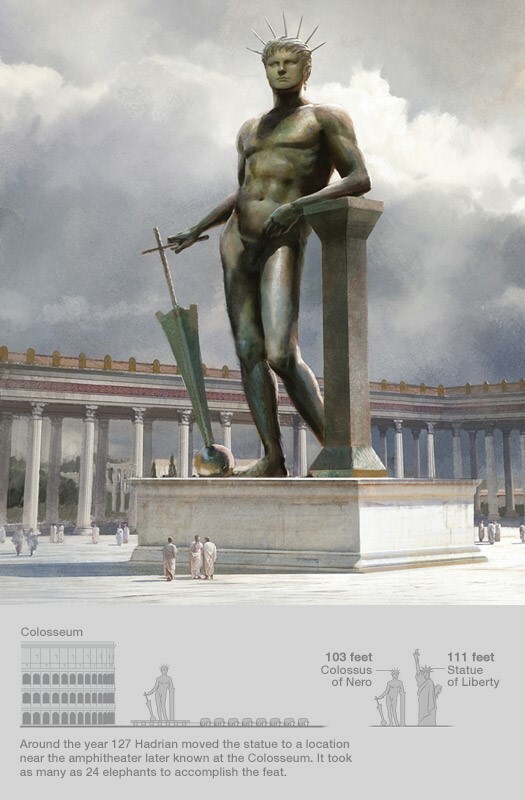 The statue would later be moved to the outside of the Colosseum, as detailed on the bottom of the image. Image from National Geographic magazine, September 2014. This blog has provided a mere glimpse of the artifacts on display currently at the HMNS special exhibit: Gladiators: Heroes of The Colosseum; and if one would like to know more about the subject matter of the City of Rome down below a list of recommended readings has been provided a for each of the subtopics above. Next Post Minerals That Kill!